There is a small pizza shop in cherry hill,NJ called Estys Bestys that has amazing Pizza! I was there a couple months ago.. really unimpressed.. I didn't find the actual pizza to live up to the names on the menu.. and crust iirc was almost inedible..
Jeruselam pizza in 5towns is best. joshs is second, make no mistake. big apple pizza in isreal is delicious. and I totally underratted uri's pizza in geula.such good dough! sorry haters..
Man I gotta hate on this list a little. I never heard of Joshs. Big apple and uris is just ... mindblowing! Nasty. Maybe you meant bottom 10? Israel is like Chicago... just don't even bother looking for a good kosher slice. Do you even like pizza? I know someone from chicago who thought they didn't even like pizza until i introduced them to some NY places lol. So where is the best NY place? This is so true, especially the part about Chicago. The pizza there is incredibly bad. And the worst part is that the native Chicagoans think it’s great, so the pizza there never improves. Just had Naomi's on Sunday, was really good. I will add though that in most places, the difference between a reheated slice and a fresh slice out of the oven is huge. We were there with my wife's family, and my father-in-law is fanatical about requesting pizza be fresh where possible. Makes all the difference in the world. What's the story with "everything is CY except rice pudding"? Is that something that's made elsewhere, or do they make that there? I love the cash registers. 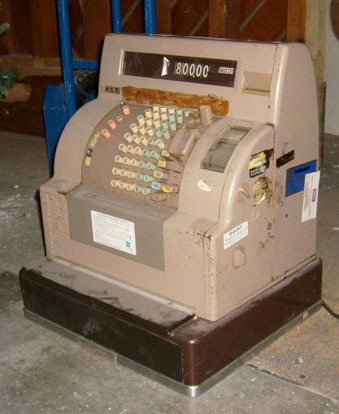 Amnon's on 13th Avenue has vintage cash registers IIRC. Love them.